Tomato puree is a tomato based product that should not be confused with thicker tomato paste often used to make pizza sauce. Tomato sauce such as tomato puree contains tomatoes in addition to added seasoning. 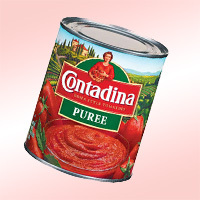 The calories in Tomato Puree per 210g(1cup) is 86 calories. Tomato Puree is calculated to be 41Cal per 100 grams making 80Cal equivalent to 195.12g with 20.79g of mostly carbohydrates、3.99g of protein、0.21g of fat in 210g while being rich in vitamins and minerals such as Molybdenum and Vitamin E Alpha Tocopherol.